We’ve all heard the tenant horror stories: late or even outstanding rent, unruly pets, damages to the property (and worse). Don’t underestimate the screening process. Thoroughly checking your potential tenant’s references will give you surprising insight that will help with your decision-making process, and save you headaches later on. At the very minimum, ask for references from previous landlords and employers on every rental application. What is the address of their property? Who were the occupants listed on the lease? What was the tenant’s monthly rental amount? Did the tenant consistently pay rent on time? Did the tenant maintain the rental property well? Were there any major damages or maintenance issues? Were there any complaints from neighbours or other tenants? Would you rent to this tenant again? Why/why not? Can you confirm that the tenant was/is employed at this company? What is the tenant’s position in the company? What are the terms of employment? Is there a trial or contract period? What are the average hours worked? What are the tenant’s long-term job prospects? How do you know the tenant? How does the tenant spend their spare time? Have you spent any time in the tenant’s current or previous home? How would you describe it? Landlords who take their time conducting detailed reference checks are usually able to quickly spot red flags. Compared to the cost of damages or lost rent, this small time investment is definitely a worthwhile investment. Do you know how to distinguish the good from the bad? Check out these 5 Potential Tenant Red Flags. Want to make it even easier? Use Pendo’s built-in Online Rental Application. It’s simple, fast, and convenient for both you and prospective tenants. Increase the volume and quality of applicants without adding any paperwork. Join Pendo to try online rental applications for free! I strongly believe that landlords should be truthful when answering the questions about the current nightmare tenant. Sometimes the landlord want to get rid of their nightmare tenant that they lie so their tenants can be someone else’s problem. Hi Daphne – We absolutely agree with you. Trust should be established between landlords and tenants as well as within the landlord community. 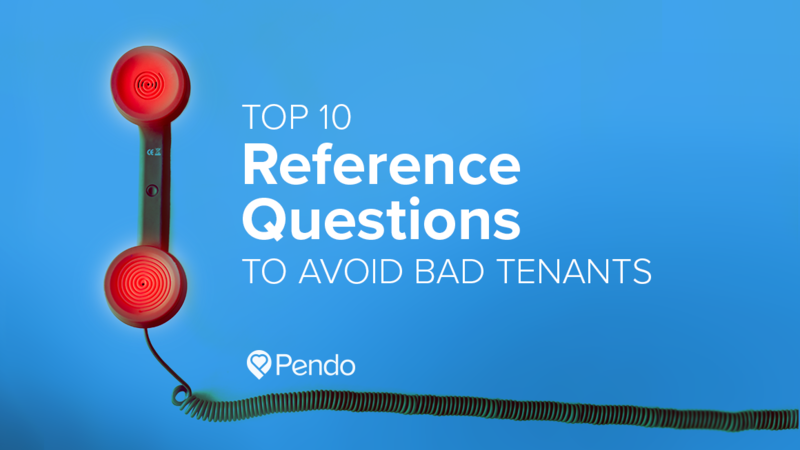 This is a great roundup of very specific questions to ask the various references your prospective tenants may put on their rental application. Knowing what to ask each reference type will make the screening process more effective and land you the highest quality tenant in your rental property. Thank you for sharing this wonderful information. Anyone that screens tenants, whether that be property owners or property management companies, is sure to benefit from asking these questions. I like the idea of the questions….but the one about marital status…Isn’t that one of the protected areas (familial status)? Glad you like the questions and thank you for your feedback regarding marital status. We have updated our article accordingly. If I found out that they were dating and not married, I would move on. Although there are many divorces these days, I have to believe that the likelihood of a bf/gf relationship would be much easier to break up. Unfortunately, I just had a rental company say that it was against their policy to answer whether they would rent to the tenants again. This is a very helpful article. The information is invaluable. Thank.you.